The record set off a brief journalistic frenzy in 1948 over its hitherto unknown lyricist eden ahbez, who had long hair and a beard, dressed in a robe and sandals, ate only fruits and nuts, had given himself a Book of Genesis first name and cosmic A-to-Z last name, and lived in a tent under the first “L” in the “Hollywood” sign. In other words, years before the word was coined in the 1960s, this guy was a hippie. He and the dozen or so other robe-wearing proto-hippies who hung around a German couple’s health-food store in Laurel Canyon called themselves “Nature Boys.” Hence the song’s odd title. Trying to figure out the story behind this weird anomaly led me to a 2003 article entitled “Hippie Roots & The Perennial Subculture“ by Gordon Kennedy and Kody Ryan. 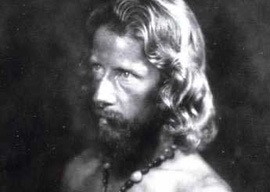 They make the case for the origins of the hippie phenomenon in late-19th-century Germany: nudism, hiking (Wandervogel), health food, and the whole back to nature “life reform” business. It’s all more or less German. On the other hand, in Tolstoy’s Anna Karenina, Levin, Tolstoy’s mouthpiece character, is a rich 1870s Russian hippie. Hence, it’s probably more reasonable to consider hippies less a solely German phenomenon than a broad one with deepest roots in Northern Europe’s blonder regions, where people tan rather than burn (as implied by the title of Kennedy’s book Children of the Sun). Hippiedom is really just a perennial sub-culture…as old as the first humans that ever walked upright….That’s why hippies will never go away…because they”ve always been here anyway. Perhaps Ecclesiastes got it right.